My first round of golf at Bandon Dunes was back in 2001 when Pacific Dunes first opened. 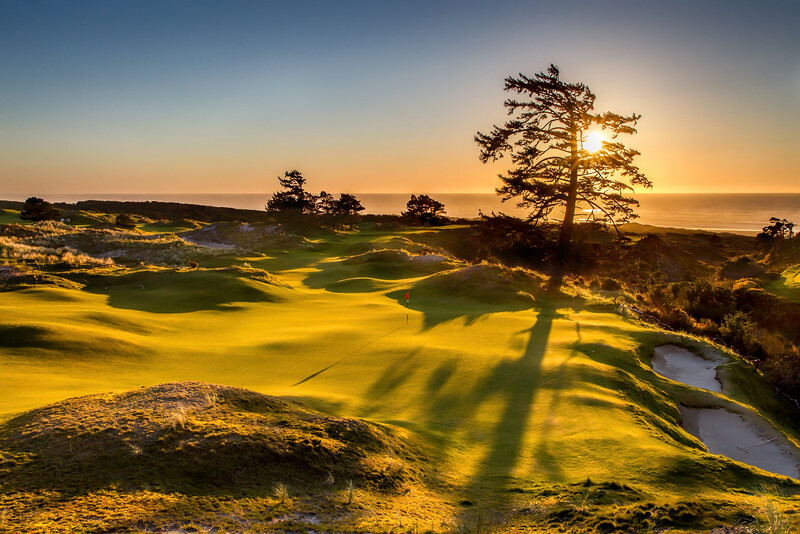 If you have yet to experience the Bandon Resort, it should be high on your bucket list. The Bandon Dunes golf courses are world class and the practice facility is incredible, but it’s the overall experience (food, service, lodging,, pace of play, etc) that really makes this a special place. We started our annual buddies trip 7 years ago with 24 guys and has grown to 48 because of the great time everyone. The biggest challenge is getting to Bandon Dunes. If you can get an affordable flight into Southwest Oregon Regional Airport (OTH) it is only a 30-minute drive to Bandon. There are flights into OTH from Portland, Denver and San Francisco but like most regional airports there aren’t a lot of options and the flights are expensive. You can also look into flying into Eugene (EUG), and then drive the two hours to Bandon. Portland (PDX) airport is going to give you the most flights and will be the lowest cost, but you’ll have a four-hour drive to Bandon. The guys in our group that aren’t from Washington fly into Portland and we pick them up as we drive down. We play a round of golf in Portland or Eugene, then drive down to North Bend and spend the night at the Mill Casino. The next morning we drive 30 minutes and play our first round at Bandon. This is a good way to break up the trip and play some of the great courses in Portland and Eugene. You won’t need a car once you get to the Bandon Resort since they have shuttles running all over the resort. If you do get a flight into OTH airport you should consider taking a car service. There are five lodging options: Lily Pond, The Inn, The Lodge, The Grove and Chrome Lake. You can’t go wrong with any of these options. They all have nice rooms, flatscreen TV’s with the golf channel and free wifi. I like “The Inn” more than any other lodge for two reasons. It’s just to the right of the 18th hole at Bandon Dunes so it’s a short walk to the main building, Bandon Dunes course as well as Bandon Trails and Bandon Preserve. If you have a group, The Inn has a nice common area you can meet to play cards, relax and have a drink. You can find hotels in the area as well as houses to rent, but you’ll pay more for your rounds of golf and it isn’t the same experience. Regardless of the time of year you should expect some wind. May is when the weather starts to get nicer and you can expect more days in the 60’s. June through September is when they see the least amount of rain. September is typically the best month. Our annual trip is the last week of February, which we have seen surprising good weather. I can only remember a couple rounds where we got hit pretty hard with wind and rain. February is still off-season so you can save some money as well. You’ll need the obvious things like rain gear and clothes you can layer. You should bring extra socks and people recommend two pairs of golf shoes during the rainy months, but I don’t think isn’t necessary. The thing about Bandon is they have really designed the whole experience around golfers. The rooms at Bandon have shoe heaters that will dry out your wet shoes. You can also give the resort your wet rain gear and they will dry them and drop them off at your room. There aren’t golf carts at Bandon so you’ll be doing a lot of walking. You’ll want to bring comfortable shoes that have already been broken in. Bandon has a good caddy program and after a recent trip to Scotland, it really showed how good the Bandon caddies are. All of the courses are easy walks and they have pull carts available so that is an option. The caddies will enhance your Bandon experience, not to mention improve your score. I may not always take a caddy, but I do when I play the Old MacDonald course. I think they have the hardest greens to read. It’s a good idea to request a caddy before your round, but they do have caddies around if you decide you want one. You should expect to pay the caddy $80-$100. This is one of the best things about Bandon. It doesn’t matter when, which course or how busy the resort is, our rounds have always been around 4 hours. They have marshals stationed around the course, but you never feel like you’re being pressured. They really have it figured out and makes for a very enjoyable round of golf. This was the first course and was designed by David McLay Kidd. It’s a great layout with plenty of risk-reward holes and ocean views. The final four holes offer a difficult Par 3 (15th), a short driveable Par 4 (16th), difficult Par 4 (17th) and a reachable Par 5, 18th hole. Each hole has unique characteristics that make this stretch of holes a lot of fun, not to mention great views. 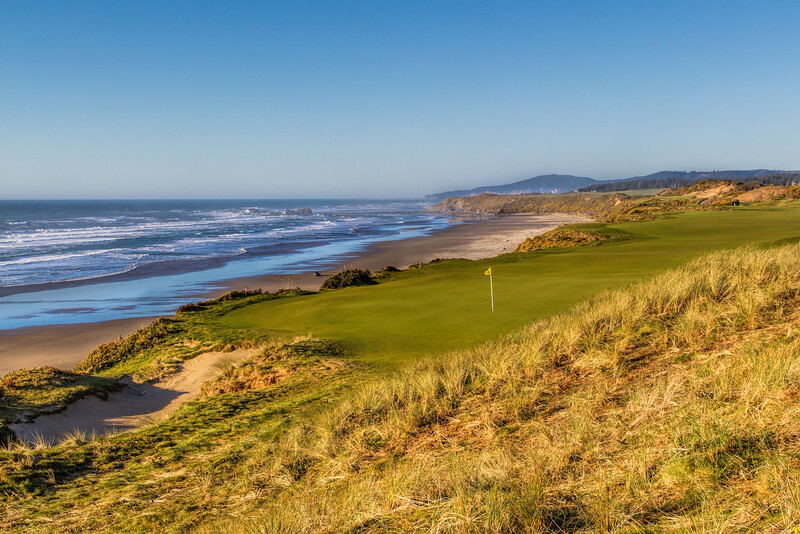 Pacific Dunes was the second course to open and was designed by Tom Doak. This was the first Bandon course I played and has always been my favorite course. It has great lines and stunning views. Like Bandon Dunes it is a good mix of risk-reward holes. One of my fondest memories was playing the par 4 7th hole. The older gentlemen playing in our group hit his approach into one of the bunkers, hit his next shot over the green into another bunker and then hit it back over the green into the first bunker. He looked at his caddie and said “that’d be enough” and walked to the next tee. The bunkering is one of the things I really like about the course. 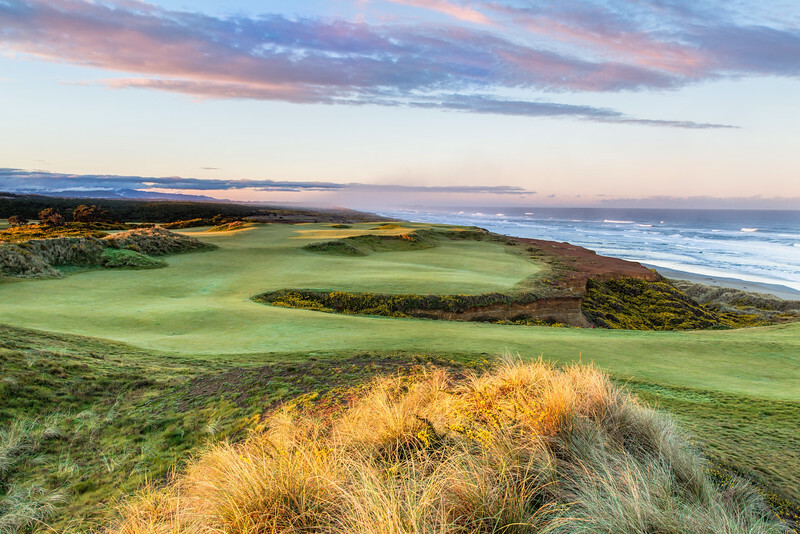 Pacific Dunes is the highest rated Bandon course by the magazines and experts. 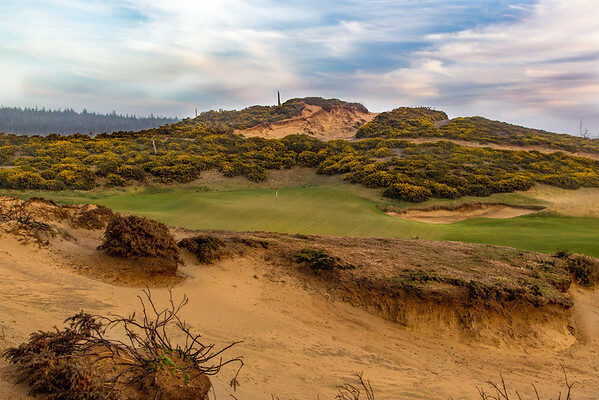 Bandon Trails was the third course to open and was designed Bill Coore and Ben Crenshaw. Trails is the only course that doesn’t have any views of the ocean and I often get asked if it is worth playing. It is a must play and I think it has the best set of Par 3’s of all the Bandon courses. To score on Bandon Trails you really need to focus and make smart decision. The opening nine can be a real challenge with plenty of risk reward holes. I also like some of the unique greens. If you have windy conditions, this is the course to play since there are lots of trees and isn’t exposed liked the other courses. Old MacDonald was the fourth course to open in 2010 and was designed by Tom Doak and Jim Urbina. It is the most open of all the courses so recommend playing this in the morning before the winds pick up. It is my least favorite course, but really love the design of the final stretch of holes (14-18). Old MacDonald has generous driving areas, but it’s the greens that make this a difficult test. You’ll find some of the largest greens you’ll ever play. The 3rd hole has a tree on the hill that you really don’t think comes in to play. However, one of the guys in our group has hit that tree three years in a row, which turns this from a birdie hole to an easy double bogey. 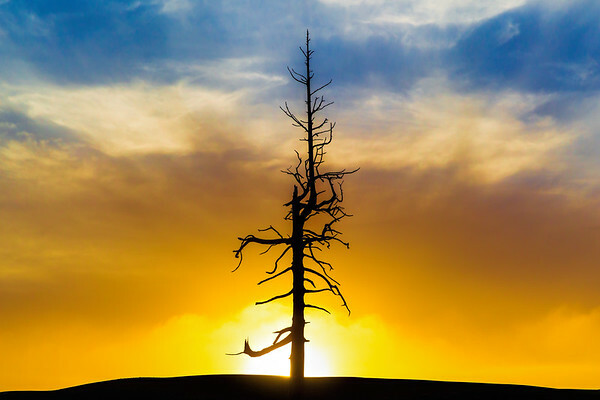 The picture below is one I took late in the afternoon as the sun was setting. Guess who now has a framed print of this in his office. Bandon Preserve opened in 2012 and is a one of the coolest par 3 courses you’ll ever play, not to mention the great ocean views. The course is only 13 holes and is a lot of fun to play. Don’t be surprised if you see someone putting off the tee box on the 109-yard hole 13 or a group of 8 playing. It’s a fun course to play late in the afternoon after your first 18. We have had a lot of fun rounds with crazy betting. There is a little shack on the south side of the Practice center, which is the nine hole par 3 Shorty’s course. This is a free course to play, but does accept donations to support their junior golf program. It’s a great course to practice your short game, but we’ll go out before or after our round with as many as 12 guys to play. The Punchbowl is the latest addition to the Bandon Resort. It’s a 2.3 acre putting green next to the Pacific Dunes clubhouse that has some of the craziest putts you’ll ever see. We have settled many of our bets at the Punchbowl. How many putting greens do you know you can get drink service at? The food and service is first class at Bandon. Make sure you experience the Bunker Bar downstairs in the Lodge. You can play pool, watch sports and join/start a card game. The resort will provide the cards and poker chips. It can be a challenge to get here, but it is unlike any golf experience you’ll have. Embrace the weather and challenge of the courses. Don’t expect to bring your traditional home course game and be able to score. Leave your 60-degree wedge in the bag and learn to the play the way the courses were designed. Listen to your caddy and try putting from 50-70 yard off the green.